Theater Thursday is here! This week for our Christmas edition we'll be taking a look at The Santa Clause starring Tim Allen. In 1994 we were given The Santa Clause. Since then it has become a Christmas classic. Scott Calvin (Allen) goes from being a corporate business man to Santa Clause over night. On Christmas Eve, Scott inadvertently kills Santa. By putting on the Santa jacket he unknowingly accepts the responsibility of becoming the next Santa Clause. Scott and his son Charlie get through the night, waking up thinking it was a dream. As the year goes on, Scott begins to notice things changing, including his body. Charlie never forgets Christmas Eve and whole heartily believes his father is Santa. Scott's ex wife believes that he's become a bad influence on Charlie. She fights to take away his visitation rights. As Scott becomes Santa he notices friends disappear, family slips away and his normal, everyday life is drifting away. You'll have to watch the rest to know the story! If you haven't seen this, add it to your holiday list. It's funny and touching! I love this movie! Might be my favorite Christmas movie. 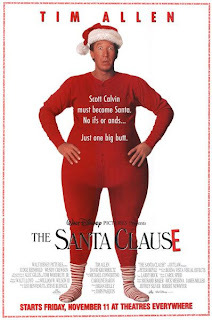 Tim Allen as Santa - genius! i love the santa clause one and two, they are 2 of my faverite christmas movies!! i need to buy them! Loving this movie. Totally. I'm hoping its on TV a lot at Christmas time. HANDS DOWN BEST CHRISTMAS MOVIE EVER! BY far one of my favorite Christmas movies, EVER!!! I did like the first one, but I think the sequels went a little downhill. This is one of my favorite holiday movies. I can remember watching it for years every holiday season. I love this movie. It's my "happy movie." I watch it whenever I'm feeling down, depressed, lazy, unmotivated or sad. You featured it today but I'm not sure you actually watched it. Give it a shot girl! Hugs! It's been sooo long since I've since this movie, I am definitely going to have to check it out again! This truly is a great movie! It seems cheezy, but its great. As for recent (ish) holiday movies, Home Alone is still my favorite!